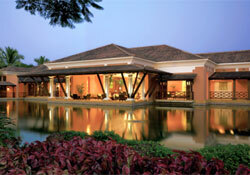 Park Hyatt Goa Resort and Spa is a 251 room spa-resort in the heart of pristine South Goa. The hotel reflects Goa's rich cultural heritage in design and brings a new vision and standard of hospitality to the Indian sub-continent. As a Park Hyatt, it will be characterised by a distinguished sense of place, incomparable design and architecture, beautifully appointed guest rooms and suites, superior amenities and facilities, and creative cuisine. Within fifteen minutes from the airport, Park Hyatt Goa Resort and Spa evokes the Mediterranean atmosphere of a Goan village. 251 beautifully appointed rooms in Indo-Portuguese pousadas are nestled among glimmering waterways and lagoons set within 45 acres of lush beachfront gardens right on Arrossim Beach in South Goa. The general Amenities available in each room of any category are like Speaker phone, 24-hour room service, Morning newspaper, Cable/satellite TV channels, 2 Bottles of Complimentary Mineral Water, Crib upon request, Dual analogue phone line with a two port modem, In-room safe, Maximum guests per room: 3 adults, Voice mail, Robes, Hairdryer, Tea/Coffee maker, 25 inch TV, Concierge, Data port, Individual air conditioning control, Iron/ironing board upon request and Thermostat . * Da Luigi is the Italian Trattoria is a haven of traditional Italian recipes. * Juice Bar offers a wide range of innovative fruit and vegetable-based drinks, milkshakes and flavored, iced teas. Park Hyatt Goa Resort and Spa Goa houses exclusive meeting rooms for conferences and gatherings. Park Hyatt Goa Resort and Spa Goa also boasts of a well-equipped business center with conference rooms as well as a legal library. Babysitting, beauty salon, car hire service, currency exchange, doctor-on-call, express laundry / dry cleaning and 24 hour in-room dining are just some of the other facilities one can avail at the hotel. Come to Goa and make the best of your holidays by staying in any of the five star hotels in Goa. Goa is the exquisite beach city of India where travelers come from all across the world and throng to enjoy sand, sun and wind. Unravel yourself amidst the natural bliss, go Goa.